A deal has been struck which is likely to see Annabel Goldie become the leader of the Scottish Conservative Party, with Murdo Fraser as her deputy. 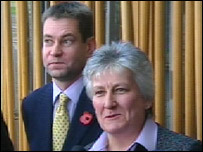 The pair announced the joint-ticket nomination hours after the process got under way, dismissing criticism of a "stitch up". They said they had decided to act in the best interests of the party. 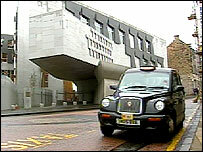 The contest was sparked when former leader David McLetchie resigned following a row over expenses claims. Miss Goldie and Mr Fraser revealed their intentions two hours after nominations opened. Ms Goldie said: "(It) is a very naturally-induced partnership and we both feel positive about how we approach the future. "We both feel positive as we consider how we should take our party and our group forward in Scotland. "We are both utterly united in doing our best to ensure there is a robust opposition presence in Scotland." She said there was work to do in tackling the "huge frustrations" about what devolution was not delivering for Scotland. It appears unlikely that any other MSP could get the support of four fellow members as required under the election rules. In this event Ms Goldie would automatically become leader when nominations close at noon next Tuesday. Mr Fraser, who said Ms Goldie would be an excellent leader, acknowledged that he could have gained sufficient support from MSPs to stand for leader. But he said a contest would have been overshadowed by the UK Tory leadership race, adding: "I took the view that this party would be better served without a contest at this time. "It was better that we united around a joint leadership platform and that's what we're planning to do to take this party forward." The Goldie-Fraser ticket could be seen as an attempt to unify both wings of the party. Ms Goldie, 55, is regarded as one of Holyrood's most able performers and will have a golden opportunity to show her credentials on Thursday when she takes on Jack McConnell at First Minister's Question Time. At the age of 40, Mr Fraser, who has regularly been tipped as a future leader of the Scottish Tories, could expect further opportunities for the top job after serving an apprenticeship alongside Ms Goldie. However, Brian Monteith said he was disappointed that he and fellow MSPs on the right of the party, including Alex Johnstone, had been unable to persuade Mr Fraser to stand for the leadership. He added: "In my opinion there was never the prospect of any other Tory MSP than Murdo attracting enough nominations to make a leadership contest with Annabel credible or worthwhile. "I certainly shall not be standing and I don't expect any other candidates to come forward." Cathy Jamieson, Scottish Labour's deputy leader, said: "A year ago the SNP changed their leader and deputy leader and they've been going backwards ever since. "It looks like the Tories are facing the very same fate. Changing faces at the top won't make the Tories any more acceptable." The SNP's Holyrood Leader Nicola Sturgeon said: "The fact that the Tories don't appear capable of having a real leadership contest shows either a fear of internal democracy, or a dearth of real talent within their parliamentary group."